"The company is also going to see if it can do something to that effect with a new helmet for Raptor pilots. So far, it has upgraded to a Scorpion helmet-mounted display, which Merchant said is “basically just a reticle” that gives the ability to employ AIM-9X targeting by looking off axis." I thought they tested it out but did not proceed in 2013 due to lack of funding. It's news to me too, a good band-aid fix. Helmet sights are part of the MLU, along with myriad new upgrades. 1) Is the Raptor flying today (operational units) with the AIM-120D? 2.) Is the Raptor flying today (operational units) with the Scorpion helmet? From what I can gather, the only birds flying with both are still in some sort of test program?? 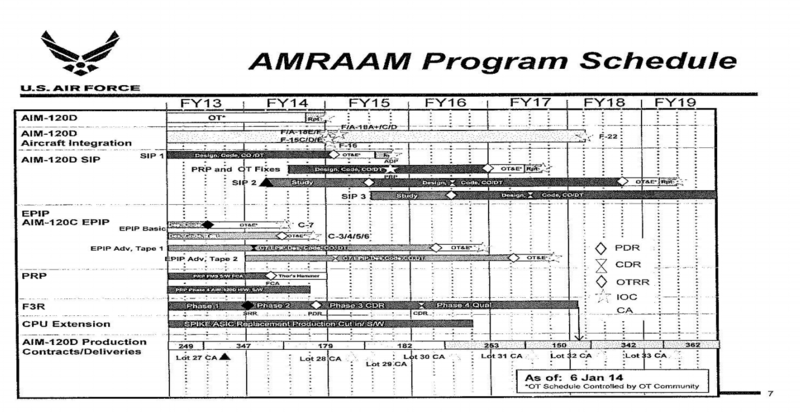 From what I've been reading, AIM-120D is part of Increment 3.2B, which has completed developmental testing in August, 2017 which led to operational testing which started in September, 2017 and was wrapped up in April, 2018. Production of 3.2B was approved this past summer and starting the summer of 2019, IOC is expected. Scorpion helmet was tested in 2013 but never materialized due to lack of funding. Wow. I hadn't realized how long and protracted the 120D development had been. Any idea why? Was it because it had to clear the Raptor's full envelope?? Per the FY2015 Budget Docs, the -D went IOC on multiple platforms in Q1 FY2015. They include the the F-15(C/D/E), F-16 (no version listed), and F-18 (A+/B/C/D/E/F). The AIM-120D went to the Raptor last, because it needed it least urgently, compared to legacy aircraft. With its stealth, and high altitude/high speed launches, the earlier variants were deemed good enough till 3.2B. I think while they didn't go for MADL in F-22 now, they probably will at some point. It definitely seems like F-22 community would like that and I'm sure F-35 community would like that too. Maybe next major upgrade? In 2024, funding kicks in for sensor enhancements, a project that is expected to run for several years. "What we’re looking for is a sensor to complement the radar that’s on the jet,” Merchant said. So some sensor that complements the radar while having longer range with target-quality track at those extended ranges? That sounds really interesting and I really wonder what this could be. With sensor fusion IRST could be that against VLO stealth targets, but that would require precise range information which could be only had with radar giving the range. In some cases triangulation might give that, but it's not that reliable method with IRST systems. I really doubt some new advanced ESM system could give target-quality tracks at extended ranges. hornetfinn wrote: So some sensor that complements the radar while having longer range with target-quality track at those extended ranges? How about, "some sensor [data] that complements the radar while having longer range with target-quality track at those extended ranges?" i.e. passive off-board targeting. Plausible... I can't think of any sensor with a longer range than radar and the statement could imply the desire for a LO data link with F-35s. I'm also thinking LO constellation-based potential. Or a drone? I'm not familiar with your "constellation" comment? Can you please elaborate?? In reading from numerous articles, it would seem that they're referring to an onboard sensor, which is likely IRST. There have also been references to a DAS-lite capability.